Combine the visit to two magical and unique places, located in areas of natural conservation, rich in biodiversity that a lover of nature can not miss while on vacation in Costa Rica. Visit the Rio Celeste Waterfall combined with Arenal Volcano - La Fortuna. 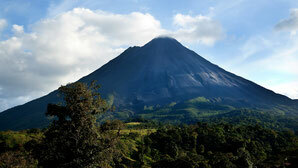 Visit to the Arenal Volcano and La Fortuna. The Arenal Volcano, its perfect cone of almost 1633 meters high and the area that surrounds it is one of the favorite places for those who choose Costa Rica as their vacation destination. While it is true that the Volcano is its main attraction in this area there is a variety of places to visit and activities to enjoy. The Celeste River is located in the Tenorio Volcano National Park and is one of the most beautiful places in Costa Rica. Its impressive Waterfall is cataloged by tourism magazines as one of the most beautiful in the world. We find two small rivers that run between mountains and whose waters when they join become an intense blue color due to the minerals they have dissolved. The blue of the river is appreciated in all its splendor on a sunny day. A beautiful legend says that God, after painting the sky, washed his brushes in his waters and this extraordinary natural phenomenon occurs. 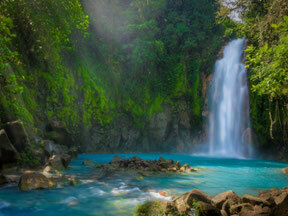 Vacations in Costa Rica: Walks, Rivers and Waterfalls. Day 1: Transfer to the Arenal Volcano area - Relax in Hot Springs. 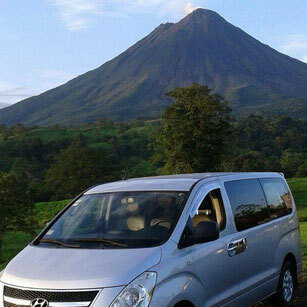 Very early in the morning, from the place that you request, we provide transportation to the area of Arenal Volcano and La Fortuna. Registration at the selected Hotel. Lunch in Restaurant in La Fortuna town. 3:00 pm. Our guide will pick you up at your hotel to take you to the National Park and take a guided walk along trails until you reach the lava pool of past eruptions, taking in clear days the most impressive view of the Volcano and Lake Arenal, as well as a beautiful sunset in the middle of nature. Approximately 5:30 pm we will be arriving at the natural hot springs that emanate from the volcanic veins to relax in the middle of exuberant tropical gardens. Buffet dinner before returning to your hotel. Day 2: Activity in the Arenal Volcano and Transfer to Río Celeste. Full breakfast at your hotel. At your choice we will take you to enjoy nature or adventure. - Visit to the Fortuna River Waterfall and Canopy or Zip Line Excursion. - Rafting Class 2 and 3 on the Balsa River. 3:00 pm. Tourist transfer to Río Celeste. Day 3: Hike through the trails of Tenorio Volcano National Park and Río Celeste Waterfall and transfer to your next destination in Costa Rica. 8:00 am. We will begin an exciting and intense walk. The route is around 4 miles (5 km) through primary and secondary forests, of medium elevation. 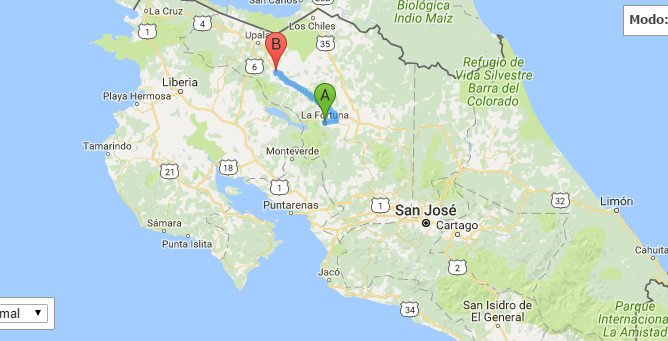 The total of the tour is approximately 4 hours to visit all the interesting sites: Waterfall, Los Teñideros, The Lagoon, Los Borbollones and the Lookout of Tenorio Volcano. Transfer to your next destination. The order of the route may vary depending on your starting point and your next destination to visit. We adjust it to the best option that allows you to enjoy the most of your vacations in Costa Rica, being able to visit first the Arenal Volcano and La Fortuna and then the Celeste River and Tenorio Volcano or vice versa. Prices per person, expressed on the basis of double occupancy. 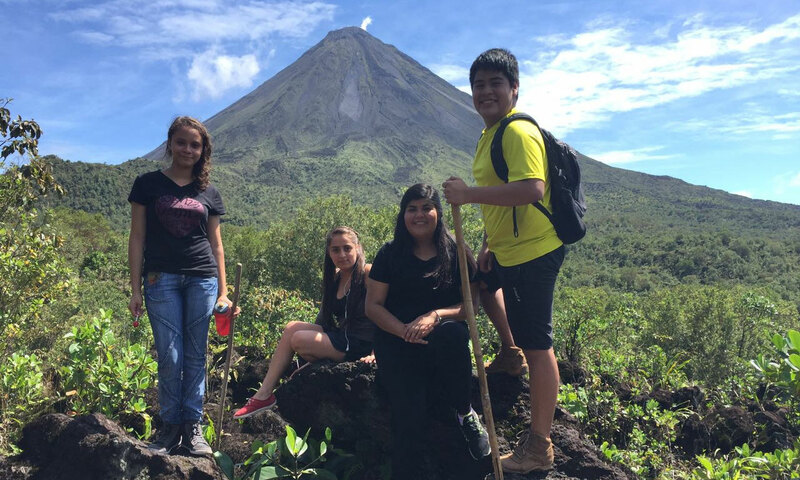 Fill out the following form if you wish to reserve or require more information about the Vacation Package to visit Arenal Volcano - La Fortuna and the Rio Celeste Waterfall and the Tenorio Volcano.